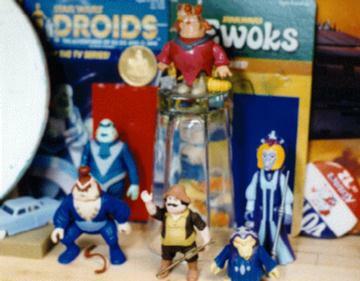 This image shows several undproduced Droids and Ewoks figures. Clockwise from the top, they are Bondo, Mon Julpa, Morag (the evil witch), Uncle Gundy, Chituhr (Bondo's sidekick), and Vlix. Bondo, Morag, and Chituhr are from the Ewoks series. Mon Julpa, Uncle Gundy, and Vlix are from the Droids series. Also, notice the Droids Vlix proof card with coin and the Ewoks Chituhr proof card.